Finally arrived after his long journey from Africa! The Meerkat was a request of multiple people. I loved the idea, so there was no doubt that I would make it. 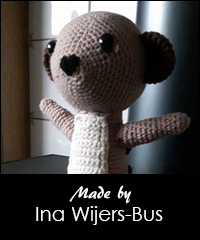 This amigurumi will be about 17 cm tall. Very easy to follow pattern ? 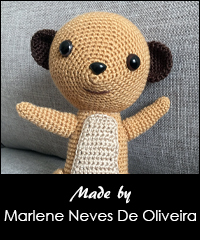 I would love to crochet this for my grandson, so lovable. What a cute little guy! I love his shape! He looks very fun to make! Wat een schattig beestje toch weer!! You have the cutest amigucumi patterns that I have ever seen. I have quite a few of them. Love all of your patterns. The meerkat is absolutely adorable. Your Meerkat is so cute. So adorable! You are very talented! That is just the cutest little thing ever. This MeerKat is sooooo cute! Wonderful job Sabrina, you do such a great job on making these characters, can’t wait to see what’s next. This pattern is so cute. My little dog use to sit up like a meerkat and look everywhere he wanted to see farther. It was so cute. He has gotten older now and injured his back being part dachshund so he can’t sit up any more but I would love a pattern of this meerkat to remember him and his lovable little quirk as a meerkat. Wooowww Girl you did it again wat laat je toch van over de wereld lieve arigurumi’s in t hoofd door om vervolgens ze uit je haaknaald laten groeien, en ons weer vol verbazing achterlaten top gedaan hoor top en erg leuk ook deze is weer een grote kroon op je werk, top helemaal top. Oh, he is very sweet. I love the stripes on his back. And I think you got his body a nice size in proportion to his head. Thanks for offering five free patterns of this. I have my fingers crossed on this one! I love this. It’s sooo cute and my dad has always loved these little guys?